The uninformed might think this place has something to do with coconuts. Perhaps indirectly, this place serves curry. However, it doesn’t serve the kind of curry that uses coconuts; instead, it’s a Japanese curry place often known for its savoriness and spiciness, brown-colored sauce, served over rice. Beloved and I enjoy Japanese curry a lot, which is why we frequently visit the place. One of the features of this place is that they allow you to choose your desired spice level, amount of rice, and additional toppings. They have a variety of “defaults” to choose from which you can customize with any of all the toppings they put in their curries. They also have some selections which aren’t the default “on-rice”, although you sometimes forgo the customization of the amount of rice and spice level. On our first visit to Vertis North’s CoCo Ichibanya branch, Beloved ordered their Pork Cutlet Omelette Curry (360 Php) at spice level 3, default amount of rice at 250g. 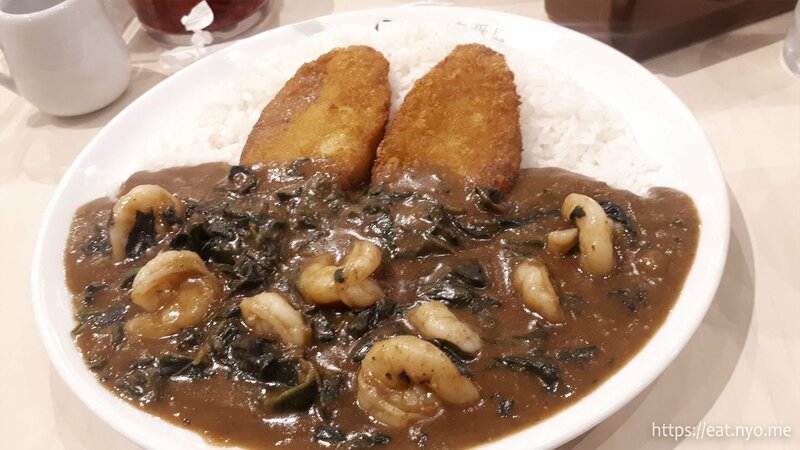 I had my favorite of their defaults (and admittedly also among the most expensive) Fried Fish and Stewed Shrimp with Spinach Curry (420 Php) at default spiciness and less 100g rice (-20 Php for 150g of rice). You can also make your order a “set meal”, wherein you can a combination of add drinks, soup, salad, and dessert. Beloved had their Set of 3 (110 Php) and chose to have their soup, salad with sesame dressing, and iced milk tea. 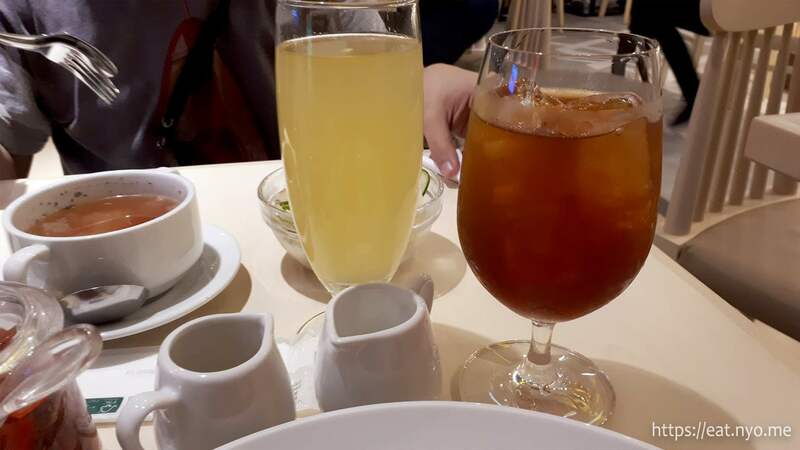 I had the complete Set of 4 (140 Php) which had the same soup and salad but instead having hot calamansi juice for drinks and two scoops of ice cream for dessert. As per usual, the sides of our orders arrived first. From the left is their soup, which is usually this tomato-ey soup with a lot of onions and tomato bits in it. Their salad is the usual green and purple cabbage with corn and cucumber topped with our choice of sauce, where we both usually choose to have their sesame dressing. Finally, each table also has a jar of pickled plum which you can add to your curry. 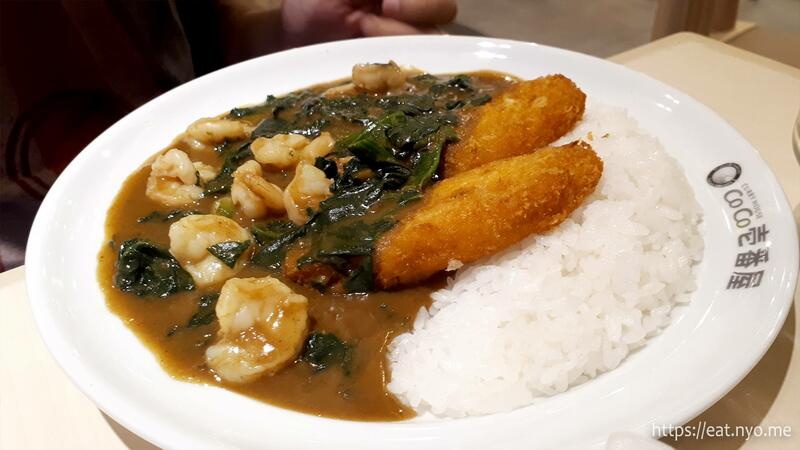 My Fried Fish and Stewed Shrimp with Spinach Curry, as I mentioned, is my favorite among their available curries. At default spiciness, it was just right for me. The selection of toppings tickle my mouthfeel sensations in a variety of ways I enjoy: from the scrumptiousness of the shrimp, to the crunch then flakiness of the fish, to the softness of the spinach. While the curry is definitely the dominant taste of the plate, they manage to preserve some of the natural flavors of each ingredient. My regret was getting less rice, since I’m practicing intermittent fasting nowadays and this was my only meal, so I didn’t get as full as I wanted to. Beloved usually has a hard time ordering here, because she enjoys a lot of different dishes. 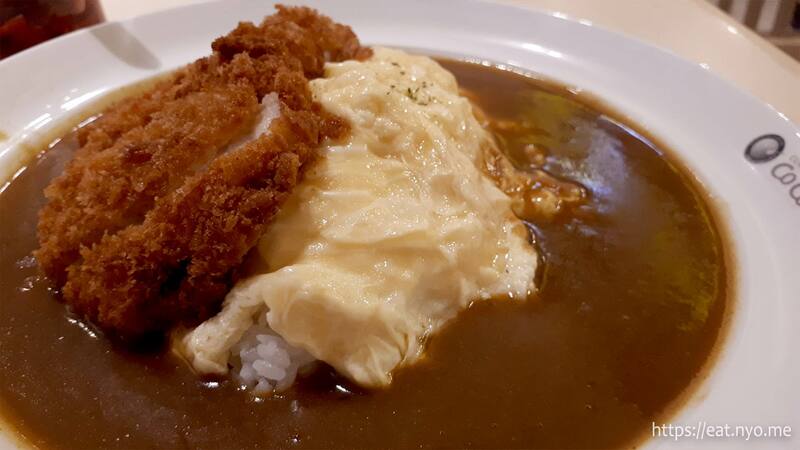 This day, Beloved’s order, their Pork Cutlet Omelette Curry was consistently delicious, according to her. Her spice level 3 is her Goldilock’s spice level and the still runny omelette adds creaminess to the plate. While we might have had better pork cutlets or tonkatsu at other tonkatsu-specializing places, CoCo Ichibanaya’s tonkotsu is still quite good and quite tender. One of the major reasons we love CoCo Ichibanya is their pickled plums. We add a liberal amount to our curries which gives it a nice crunch and slight sweetness and tartness that balances the spiciness. 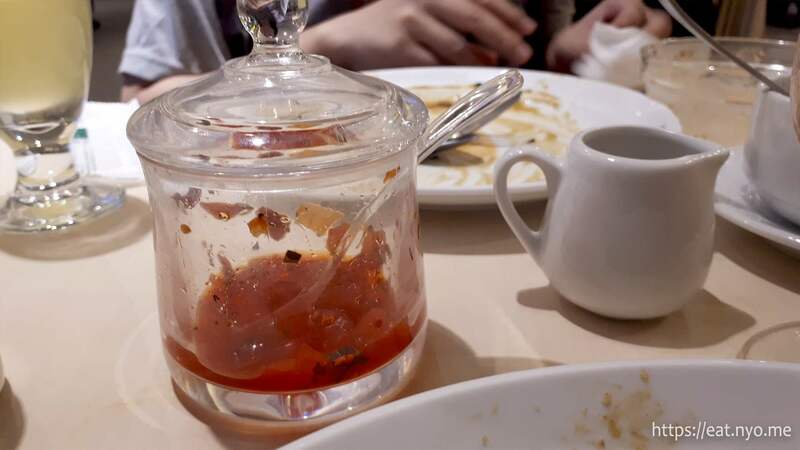 From full, this is usually the state of the pickled plum jar after our meal. As for our drinks, this is conclusively our favorites. I usually get either their calamansi iced tea or hot calamansi juice, the latter being my choice for this day. Beloved always gets their iced milk tea. If you buy this individually, they cost 100 Php, which is why we usually often make use of their “set meal” offering. 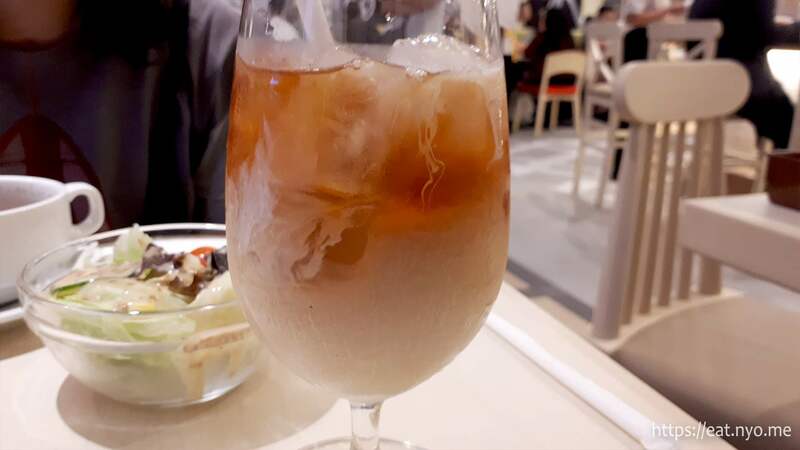 Their milk teas are actually iced tea where you mix in the milk and sweetener manually, as seen above. This is actually a nice drink to have to wash down the spiciness of the curry should you choose to have an above normal amount of spiciness. Such is not required on the default level, I feel. And if you make use of the “maximum” deal at 140 Php, you also get the above, two scoops of their various ice creams. Today, we were given cookies and cream and strawberry. I enjoy the fact that they add some fruit slices and is served in a frozen bowl, preserving its coldness. Only one of us orders a set of four (or three, when we don’t feel like having drinks) because Beloved and I share this dessert. The first visit mentioned above happened quite a while ago, actually. This was before I went to my odyssey in the Netherlands. When I returned, the night after trying Ippudo Zero, I had a craving for delicious vegetables after getting to try out the marinated eggplant at Restaurant Toledo. Since CoCo Ichibanya is among the few which fits the criteria, we decided to have dinner there again after work. This time, Beloved ordered what I ordered before, their Fried Fish and Stewed Shrimp with Spinach Curry curry (420 Php) and instead had it at her favorite spice level 3 with normal amount of rice and as a Set of 2 (90 Php), choosing soup and salad. I ordered their Pork Cutlet and Vegetable Curry (440 Php) where I added Spinach (60 Php) and had it as a Set of 3 (110 Php)—choosing their soup, salad, and dessert. This time, I opted to try the Japanese dressing. Looking back, this was the first time me trying this dressing instead of the usual sesame, and it tasted very much like a vinaigrette. Aside from being much spicier than my default order here, their Fried Fish and Stewed Shrimp with Spinach Curry was consistently delicious. Looking back, this is perhaps the perfect amount of rice to enjoy this dish. Rice lovers might want to add even more, although I personally won’t recommend it. My creation of their Pork Cutlet and Vegetable Curry with spinach added proved to be a failure in terms of sating my delicious vegetable cravings. Not that it’s bad; the vegetables, specifically potatoes and carrots, were quite soft and hefty. Sadly, they didn’t taste as memorable as the eggplants in Toledo. As a meal, though, it definitely filled me up. Similar to my usual order, this dish presented a variety of pleasing mouthfeels with a taste dominated by the curry with just the right amount of spiciness for me. Additional crunch is provided by the pickled plums and adding in the spinach gave it a pleasing mushiness; giving the entire dish an overall balance in terms of texture. We talked about our recent ventures to CoCo Ichibanya with some friends, who also enjoy the place. 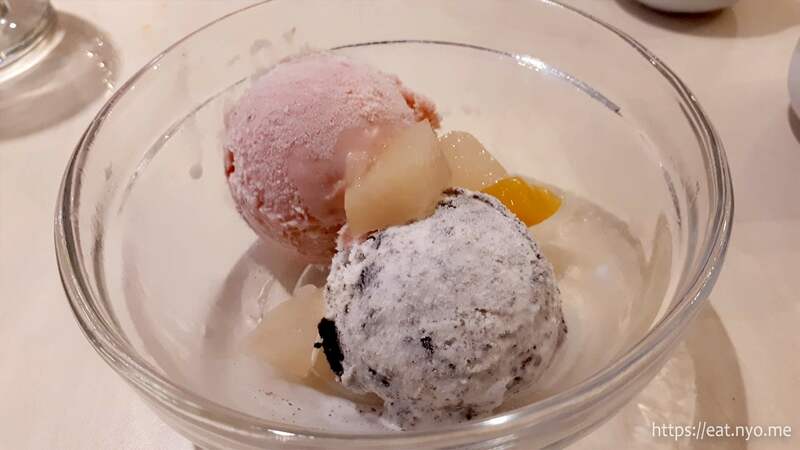 One of them talked about their cream croquette, a topping we never tried before which he suspected to be made of crab. Curious, at the end of the same week from our last visit, we decided to go back. 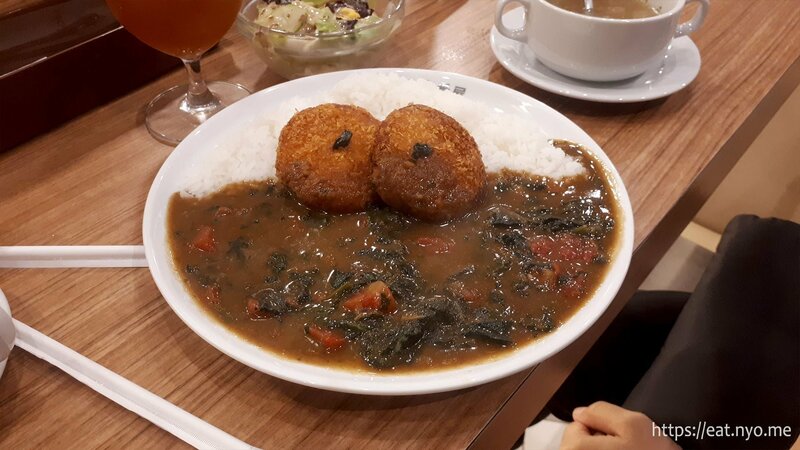 Since my primary mission that day was to try their cream croquette, I ordered their Cream Croquette Curry (260 Php) and added on my favorite spinach (60 Php) and tomatoes (40 Php). I made it a Set of 4 (140 Php), choosing calamansi iced tea for my drink and the rest of the usuals. Beloved, after a difficult time deciding, had their Clam, Spinach, and Tomato Curry (360 Php) and added on scrambled egg (60 Php) at her favorite spice level 3 and made it a Set of 2 (90 Php) chosing her usual iced milk tea as her drink and soup. My Cream Croquette Curry with spinach and tomatoes was quite a sloppy creation visually. 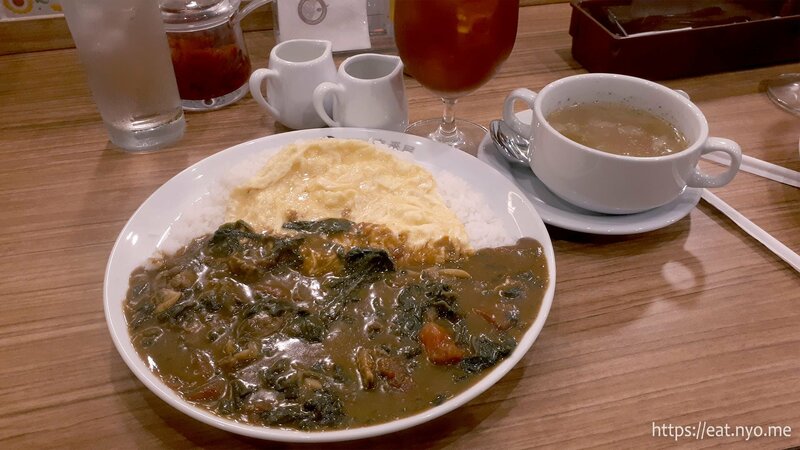 We were already aware that spinach and tomatoes, when added with pickled plum, basically gave us our favorite veggie choices when it comes to Japanese curry. The cream croquette was surprisingly delicious. It wasn’t made of crab, sadly, but I can understand why some can mistake this creamy, milky potato patty for crab cakes. Beloved’s Clam, Spinach, and Tomato Curry with added on scrambled egg was also quite a sloppy creation visually. While the texture it provided were mostly soft, the clams actually imparted a lot of clam taste to the curry. The scrambled eggs were cooked similarly to the omelette dish Beloved had the first time around and was still quite runny. 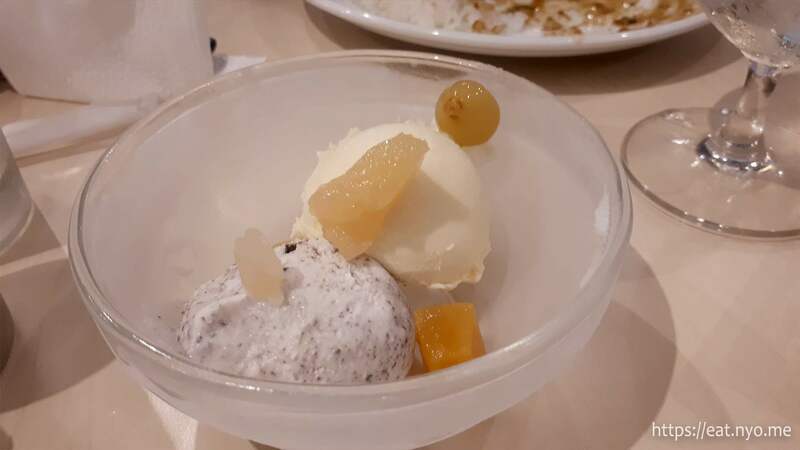 Our visits to CoCo Ichibanya are usually expensive, and usually result in a bill of over 1,300 Php because of our choice of toppings and making use of the set meal. Our last visit, since we didn’t have the more expensive items, was one of the less expensive visits at just a little above 1,000 Php. You can actually go here for around 300 Php per head, but you’ll be restricted with less variety of toppings and would most likely have to forgo having their set meal. 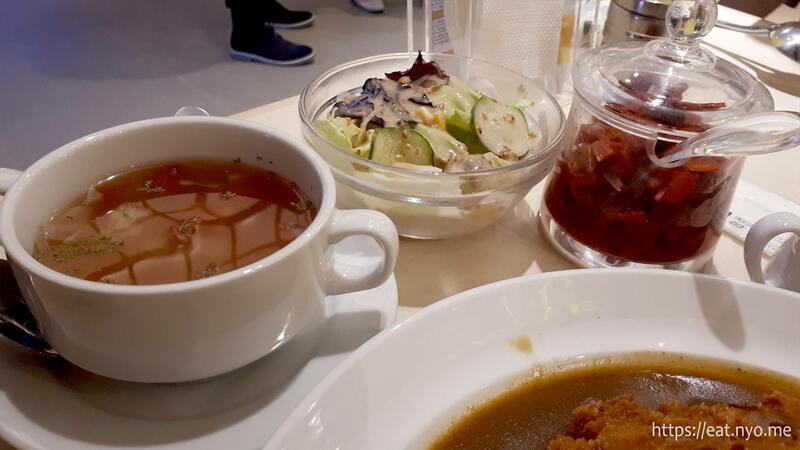 Even then, this is definitely our go-to place when we’re craving for Japanese curry, and definitely the place I’d recommend to someone craving for Japanese curry. I can also recommend this place to vegetarians as my last order was actually a vegetarian dish and they do have a lot of vegetable curry offerings. Finally, I’ll also recommend this for those who tire of “usuals” and want to try something different each visit. With the diversity of toppings offered, there’s countless of combinations you can try. Beloved and I have yet to scratch the surface of the different varieties you can come up with in terms of toppings at this place. Add in the fact that you can customize the spice level and amount of rice, I bet the overall number of varieties this place offers is one that you won’t be able to reach in your lifetime. 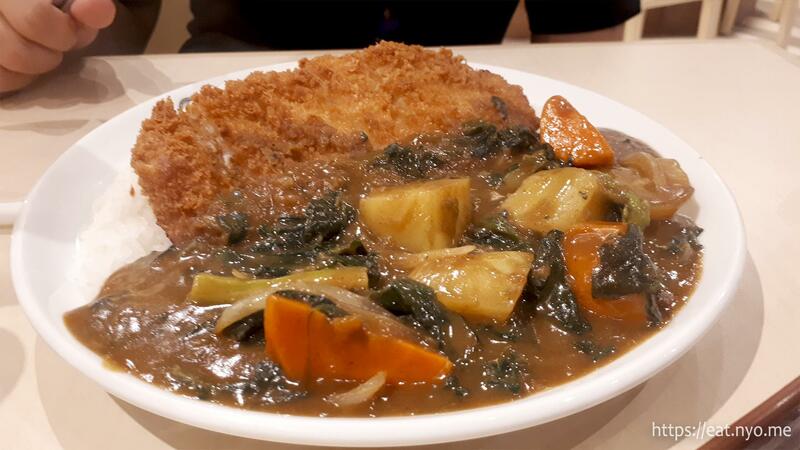 Of course, you might be able to find that one combination you’ll always order to sate your Japanese curry cravings. Hopefully our three recent visits to CoCo Ichibanya will sate that craving for quite a while. Budget: ~300-600+ Php per head. Recommended for: Japanese curry lovers. Not recommended for: Those who cannot tolerate even a hint of spiciness. Smart nomnomnom tip: Make use of their ‘Set Meals’—it’s cheaper than getting a drink.